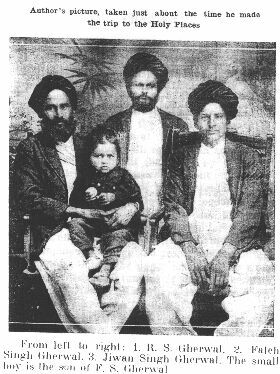 The book is about Rishi Singh Gherwal's claimed trip with the Himalayan Masters between 1922 and 1923. 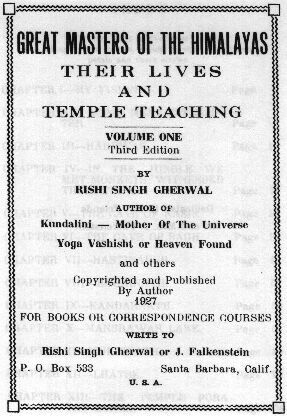 In this book he writes about his trip to the caves with Yogis, Sadhus, Swamis, Sanyasis, Munis and Rishis. It is perhaps well to tell my readers that Lamas and Yogis do not share the same belief. Lamas are adherents of Buddha alone - a Yogi could not believe the assertions of any one man. Yogis believe each human being has all knowledge within himself. At some time the individual will unfold and realize his mightiness; a Buddhist will reach the Buddha attainment of Nirvana; a Christian will reach the Christ consciousness; a Mohammedan will realize Mohammed; a Hindu will attain the state of Krishna. Hindus assert that Krishna, Buddha and Christ are all the same. They are within you - your God is within. Everywhere one hears God made man in his image. Tibetans have their God: China, Japan, Asia, Europe, America-all have their Gods. Hindus have many gods: a god of death; god of knowledge; god of fire. It is very difficult for everyone (including the Hindus) to understand these gods unless they study the Upanishads. Every country has its God. I am at a loss to understand how "God made man in his image." One says Jehovah the other says God. One Allah, the other says Khuda. One says Punmeshara, the other says Raba. One says Akal, the other says Seva. One says Wahai, the other says Ishwara. One says Almighty, the other says The Universal Spirit. One says Om, the other says Brahma. Different names and different Gods. All that is claimed is that "my God is better than your God." it seems to me, that man has made God in his image. ...One very old Lama said:" The same beliefs are not shared by Lamas and Yogis. The Yogi cannot believe that the teaching of any one man can be final; he sees that every human being has access to all knowledge right within himself, while Lamas are adherents of Buddha alone. In all probability, each human will unfold and realize his mightiness. A Christian will reach the Christ conscousness, a Buddhist will reach the Buddha attainment, and so on. All have their gods, and on every hand one can hear that God made man in his image. All nations and all peoples have their different gods. Some have their god of fire, others have the god of harvest, and so on. Each has a better God than his brother. How am I to understand that God made man in his image, unless from the many gods set up, I would say that each man made God in his , man's, own image? -Life and Teaching of the Masters of the Far East volume 3 (Copyrighted 1935), page 106-107. "To my delighted surprise Master Bhagavanji appeared that evening right out of the air!" Yogi Santokh Santi and the teaching of a nameless Saint.